There are ‘Best Of’ posts and articles all over the place at the moment, and I always find myself wondering what reviewers’ criteria are. Most likely to re-read? To recommend to a friend? Most moved by? Most excellent writing? I now forgive them all for not specifying, because when I decided that I’d try a monthly post I couldn’t come up with criteria for myself. I will simply say, these are the books I loved the most this month, and I’ve given myself only one rule: they must come from different categories. For the last two years I’ve written a simple wrap-up of books I loved during the year, but I felt it wasn’t that useful not being able to say much about them individually. So this is a bit of a test run on doing some mini-reviews, a bit more of my thinking than I can manage in a tweet or an annual catch-all. Best Queer Read: Tipping the Velvet I’ve read a few of Sarah Waters’s books, but this one has leapt to first place for me. From that first evocative line, ‘Have you ever tasted a Whitstable oyster?’ I was deep in it. Her characters are glorious, I always want to be best friends with them, and how, HOW does she write so that every scene is so real that you can feel it on your skin? I’ve been thinking about how this pulls ahead of the others I’ve read (Fingersmith, The Little Stranger, and The Paying Guests), and I think it comes down to identifying more closely with the main character. Also, there’s a lot of the river in it – Nancy grew up by the estuary – and as you know, I love anything to do with water. Queer reads is a focus for me this year, and there’ll be more Sarah Waters, I’m planning to read Affinity next up. 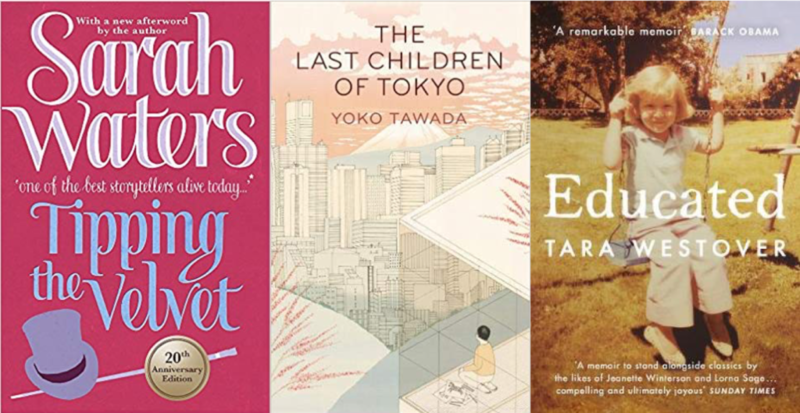 Best in Translation: The Last Children of Tokyo Talking of focuses, I’ve been seeking out more east and south east Asian books, having really loved so many that I’ve come across in the last couple of years. This book was recommended by several people I follow on booktube, and it didn’t disappoint. It’s set in a future in which Japan is suffering from serious environmental contamination, and while elderly people live essentially forever, children are unable to get enough nutrition and therefore die young. It has no plot, but I decided I didn’t care, It’s utterly beautifully written. Also I can’t help sneaking in an honourable mention for an anthology of Japanese short stories, all women writers, that my friend lent me, called Heaven’s Wind, I’ve asked her to look out for more by a couple of the authors when she’s in Tokyo next week. Best Non-Fiction: Educated This book has been everywhere, and I think it deserves it. On one level, it’s a fairly standard heartwarming true story of coming-of-age and escape from a miserable childhood and family background. But what put it right up there for me was the way in which Westover so beautifully articulates the shifting of her mind. She doesn’t just escape her physical circumstances, she has to navigate a massive shift of reality as she comes to understand the outside world and how she operates within it as an individual. As she puts it: ‘to see and experience more truths than those given to me by my father.’ She also explores the slipperiness of memory, and often during the book gives examples of events that are remembered differently by her siblings – in the wider context of history and writing down the ‘truth’, that’s a phenomenon I find really fascinating. So that’s three for this month, let me know if you’ve read them, and agree or disagree, and tell what you’ve loved reading lately.